Un appareil emportant le radar israélien EL/M-2085. Un appareil destiné à l'Armée de l'Air singapourienne a été présenté pour la première fois au salon de Singapour. The Republic of Singapore Air Force (RSAF) is publicly displaying its modified Gulfstream 550-based airborne early warning (AEW) platform for the first time at the Singapore Airshow. Singapore received its first aircraft in February 2009 and has ordered four of the G550s. 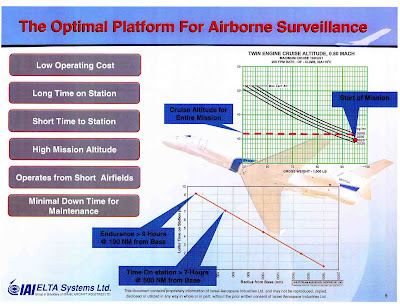 The service has been highly secretive about the aircraft, which Flight International understands has been modified to carry the Elta conformal AEW platform. While the RSAF has never confirmed the specifications, we understand that it has a similar configuration to the Israeli air force's G550-based conformal AEW (CAEW) aircraft, which entered service early 2008. Israel Aerospace Industries subsidiary Elta says the CAEW platform offers a mission endurance of 9h when operating at an altitude of 41,000ft (12,500m) and 185km from its home base. The aircraft features dual S-band radar arrays at the front and rear, plus L-band sensors on the fuselage side, providing 360° coverage. Israel's configuration has six on-board operator stations. The modified G550 also has pod-housed electronic support measures equipment, plus satellite communications and line-of-sight datalinks. 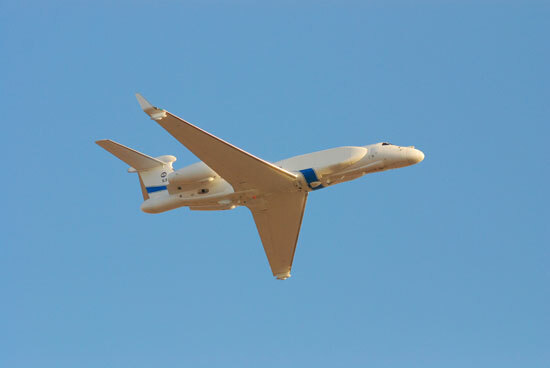 Elta says the airframe modifications have "minimal impact" on the business jet's performance. According to a previous statement by Singapore's defence ministry, the formal delivery period for its G550 AEW aircraft is late 2008 to 2010. The aircraft will replace four Northrop E-2Cs that have been in service for more than 20 years. Industry sources say that the four AEW-configured aircraft are expected to cost the island state up to $1 billion. A fifth, unmodified, business jet is also being acquired to support training activities from 2012 under a 20-year private finance initiative deal with ST Aerospace.